We are having our Annual Spring Vendor’s Meeting this evening, March 18 at 7:00. It will be held at the Rexburg Tabernacle. Any and all vendors who are planning on or who are interested in vending at the Rexburg Farmer’s Market this year are welcome and encouraged to attend. Our market year will go from May 9 to October 17 (both Fridays). Markets will be held Fridays from 4-8 pm again. We have begun accepting applications, and will do so until March 13. We will also have our first general market vendor meeting to elect Board Members on Thursday Mar 13 at 6:00 pm- 7:30 pm. You can bring your application and fees to the meeting – just let us know on facebook if you are interested and what you might be selling. Let us know if you are also interested in being on the Market Board of Directors. We have two seats to fill this year. Any applications received after March 13 will pay a higher market application fee. We are looking for people to do more fresh cheeses (even fresh mozzarella), goat cheese, breads, flowers, pastries, muffins, and even produce. Anyone want to have a salad booth with a variety of fresh greens? 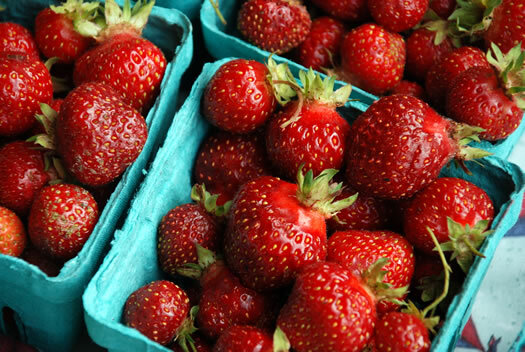 At the market tomorrow, we will have: cherries, blueberries, strawberries, cucumbers, summer squash, tomatoes, peppers, rhubarb, apples, carrots, asparagus, chives, radishes, swiss chard, spinach, and more… Come See us, We’d love to say hi and visit with you a bit tomorrow. On June 28, we are hosting a fun and educational health fair at the market. We are asking health professionals to contact us if they want to be involved (call Jamie at 390-0595 for more info). We are asking the community to come and support their local health professionals. You might learn something, get a free exam or we might have some surprises in store for you. We will hold an annual vendors meeting for all participating vendors in the 2013 season on April 19, 2013 at 6:30 pm. The meeting will be held at the Rexburg Chamber of Commerce Building (use the back entrance – accessed from the parking lot where the market is held). This meeting is mandatory and you will be charged a fee for not attending before you can sell at the market. Applications are also due before this date, otherwise, late applications will be charged a small late fee to participate in the market. We want to be prepared for our first day on May 10. If you are interested in the market, feel free to attend and learn more about the market. Bring your questions and learn what fun things we have planned for the market this year as well as new policies and rules we need to follow.